Our 2011 Phoenix Award honoree, Pam Louie, is a local girl. 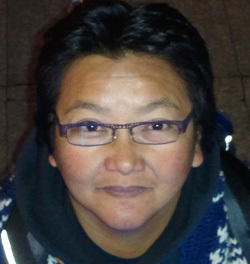 Pam Louie is the recipient of APIQWT’s 2011 Phoenix Award. APIQWTC’s 2011 Phoenix Award honoree is Pam Louie. Every year, APIQWTC presents the Phoenix Award to someone for their lifetime achievements and contributions to the API queer and transgender community. It’s our way of recognizing the many members who have done so much for our community in countless ways. And Pam is of those women who personifies the Phoenix Award! Pam is a local girl, she grew up in Oakland’s Chinatown and spent her entire educational career in the Bay area, from public schools in Oakland to the University of San Francisco, Golden Gate University, UC Berkeley and Stanford. She grew up with 6 sisters, and all 7 were raised by her mom when her father died at a young age. Dad was Chinese and mom is a mixed-blood from Filipino, Hawaiian, American Indian, and Mexican ancestries. Pam still remembers her mom’s beauty salon on Lakeshore Ave (right across from the current Trader Joes). At school, Pam was an athlete, played competitive rugby and formed a rugby team with her friends, called “Peninsula CHAOS”. For fun, she made a film with some lesbian friends called “Fun with the sausage”. Pam has a son, Robert (32) and currently works as a financial controller at a Bay Area local non-profit organization. Pam’s involvement with our community goes back more than 20 years, when she was a tireless board member of APS (Asian Pacific Sisters) and APLBN (Asian Pacific Islander Lesbian and Bisexual Network). There, she organized numerous events, such as the SF pride parades, our annual banquet, the Rice Balls, drag king fashion shows, the 1993 (??) March on Washington, and two APLBN conferences in Santa Cruz & Los Angeles. Pam has a passion for music and dance – and she was able to combine this interest for our community by providing an API queer space by co-founding “Jaded”, a co-gender dance club in 1996. Jaded was a major hit for the API queer community for years. We have many fond memories of flyering in the City in the middle of the night. Pam and the other owners also made it a point to contribute all of Jaded’s coat-check proceeds every month to non-profit organizations in our community. After Jaded, Pam continued with her passion and formed PersuAsian, which became Flaava. Pam has also been a generous donor and sponsor of our community for many years. Whenever the API queer community needed money for events, Pam never hesitated to pull out her wallet year after year. She’s sponsored the API float for the pride parade in San Francisco, rented a dragon for the SF Lunar new year parade, donated seats and tables in past APIQWTC banquets, as well as at NCLR, LAVA and API Wellness galas. She sponsored films and hosted receptions before QWOCMAP was formed, and hosted numerous dance events, like Trikone’s pre-pride-parade-party and GAPA’s Runway events. She’s also sponsored the dragon boat team, Rainbow KOI.